Edmonton Eskimos running back John White will miss the rest of the CFL season after tearing a knee ligament in last week's 23-19 victory over the Montreal Alouettes. White tore the anterior cruciate ligament in his right knee, the Eskimos said Monday in a statement. UPDATE: According to TSN CFL Insider David Naylor, Edmonton has reached out to free agent running back Shakir Bell. Bell was cut by the Ottawa Redblacks during training camp and played with Edmonton during the 2015 and 2016 seasons. Naylor adds the two sides are currently not close to a deal. The 25-year-old native of Torrance, Calif., was hurt in the first quarter on Friday night after planting his foot on a handoff play. White had 104 rushing yards and a touchdown in Edmonton's season-opening 30-27 road win over the B.C. Lions. In 15 games last season, White had career highs of 886 rushing yards and 464 receiving yards with nine touchdowns. 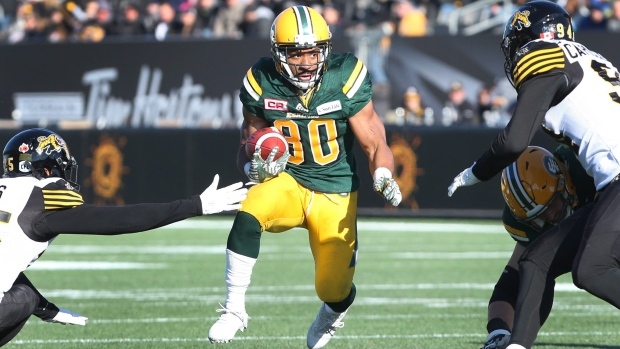 He has spent his entire four-year CFL career with the Eskimos.